For a competitive mountain bike athlete looking to improve, training with a road bike may not seem like a likely place to start. However, utilizing a road bike for a portion of training can not only lead to greater gains in mountain bike specific strength and endurance, it will provide variety and recovery from the trail. 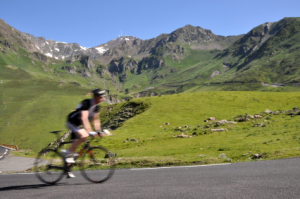 In this article we are going to discuss how to use road cycling in your training as a mountain biker. We will discuss mechanical differences, pros and cons, timing of road workouts, and specific workouts. The road bike, compared to a mountain bike, is a more efficient use of your energy. Energy is less wasted on a road bike due to the higher pressure tires with greater traction and a rigid frame. On a mountain bike, some of the power you generate is absorbed by the bike via the front and rear suspension and softer, lower-pressure tires. You also “lose” some of your power output on off-road terrain due to having less traction, such as on loose dirt or gravel roads for example. Cycling on a paved road will provide a more consistent surface to train on compared to most, if not all, off-road terrain. This allows an athlete to train with very consistent intensities in order to target specific training adaptations. Working long, sustained efforts on the road will allow you to place a greater aerobic demand on the muscles. This can be used to gain greater overall cardiovascular and muscular endurance which will significantly benefit all your training on the mountain bike. Long duration efforts on the road, at any intensity, are easier on the body compared to long duration efforts on a trail, especially on the upper body and core. Upper body and core conditioning for a mountain biker is important, but you must recover from large volumes of trail work in order to improve upper body endurance and strength. Incorporating road training will allow you to give the body rest from the impact of the trail while you continue to build greater overall cardiovascular and muscle endurance. Sustained efforts on the road will also force you to work with a steady cadence, which will help develop better form and a smoother pedal stroke on the mountain bike. On a trail, cadence is intermittent at times between coasting and maneuvering obstacles, but when needed, a smooth pedal stroke and good form matters. Obviously, a road bike is not a mountain bike. It can help you gain strength and endurance but it cannot train you for the specific demands of a mountain bike race. The faster you can maneuver past roots, logs and rocks, the faster you will ride a trail. This takes proper body position and timing that can only be trained on the mountain bike. So, with too much road cycling, you can lose the vital skills needed for the trail. So how often should you ride on the road? Training on the road can play a larger role in training during the base and early build periods, when specificity is a lower priority. A good general guideline would be to spend two to three days on the road with at least two mountain bike rides per week in the early season. As you approach your early race season and lower priority races, reducing your time on the road bike to one or two days a week will allow you to gain more form and train more specifically for the mountain bike. Plan to spend the five to seven days leading up to your B priority race on the mountain bike, to gain a good feel for it going into the race. Four to six weeks prior to your first peak event of the season, spend the majority of time on your mountain bike to dial in your skills. You can still incorporate one or two road rides a week for variety and structured training, except for the final two weeks leading into a peak event. At this point, switch over entirely to your mountain bike. This will allow your body to fully adjust to your bike and the specific skills needed on the trail to do well in the race. Focus on longer duration efforts during your base and early build periods to improve cardiovascular and muscle endurance. Do this workout one or two days a week. Can be used for short or long workouts. Between each effort spin in zone 1-2 for 10-20 minutes with a natural cadence and deep breath As you ride into the early race season, creating more specific road workouts will provide more benefit. Do this workout one or two days a week. Ideally used for short duration workouts of 1-2 hours. Between each hill effort spin in zone 1-2 for 10-20 minutes with a low perceived exertion and deep breath. In conclusion, training on the road bike is a great tool for a competitive mountain biker. Road cycling will allow you to build greater fitness without the abuse of the trail. But always keep in mind, to be fast on the trail, you must ride the mountain bike. There is no substitute for learning how to power a bike through the wilderness, especially while in a race.